Let’s face it, it’s been a long brutal winter. And there’s no better harbinger of spring than butterflies — more specially Monarch butterflies as they emerge from hibernation along the Northern California coast. After spending several months clumped together in clusters in eucalyptus trees, these dainty creatures become more active as they fly around, mate, and prepare for their flights inland to lay their eggs. And although they are certainly a sight to behold when they are all clumped together during the winter, the pre-spring months offer a more active view of the swarm. So check out these three accessible Northern California Monarch sites this month, and enjoy a very colorful taste of spring. But don’t tarry, as these winter visitors will be long gone by the end of March. There’s no better place to catch a glimpse of these migrants than in and around Pacific Grove — aptly nicknamed Butterfly Town USA. In fact the Monarch Grove Sanctuary (www.cityofpacificgrove.org/visiting/monarch-butterfly-sanctuary) is one of the top Monarch habitats on the coast, as it attracts over 25,000 migrating butterflies during the winter. The Monarch Grove Sanctuary is located off of Lighthouse Avenue, just south of the Pacific Grove Municipal Golf Course. Keep an eye out for the Butterfly Grove Inn, then turn south on Ridge Road. A white picket fence marks the path to the grove, but accessible parking is located further down Ridge Road on the left. From there; it’s a level roll up the street to the sanctuary entrance. A .15-mile hard-packed dirt path leads through the grove and dead-ends in the adjacent neighborhood. There is an accessible porta-potty near the end of the path; and although the trail has level spots every 20-30 feet, some manual wheelchair-users may require assistance up the slight grade on the return trip. The best time to hit this site is in the afternoon, because as the temperatures warm up, the butterflies become more active and start to fly around through the grove. Although they might not be apparent at first, take some time to scan the tips of the pine and cypress trees, as those are their favorite landing places. Also keep an eye out for what looks like clumps of dead leaves, as these might be clusters of the overwintering Monarchs. Docents are on duty in the season to help point out the butterflies, but for the best experience bring a pair of binoculars to get a closer look at the Monarchs. Another favorite Monarch overwintering habitat is located up the coast in Santa Cruz, at Natural Bridges State Beach (www.parks.ca.gov/?page_id=541). Just take Highway 1 north from Pacific Grove, until it turns into Mission Street in Santa Cruz. Turn left on Swift Street, which is the first traffic light after the Safeway, and follow the road until it dead ends on West Cliff Drive. From there, turn right and follow the road along the ocean to the park entrance. The day use area is located a short drive up the park road. There’s accessible parking in the large lot with level access over to the visitor center. Inside, there’s barrier-free access around a number of interpretive exhibits about the butterflies, their habitat, and of course their migration. Accessible family restrooms are located just outside the front door of the visitor center. The Monarch Boardwalk is located just to the right of the visitor center, across the service road. 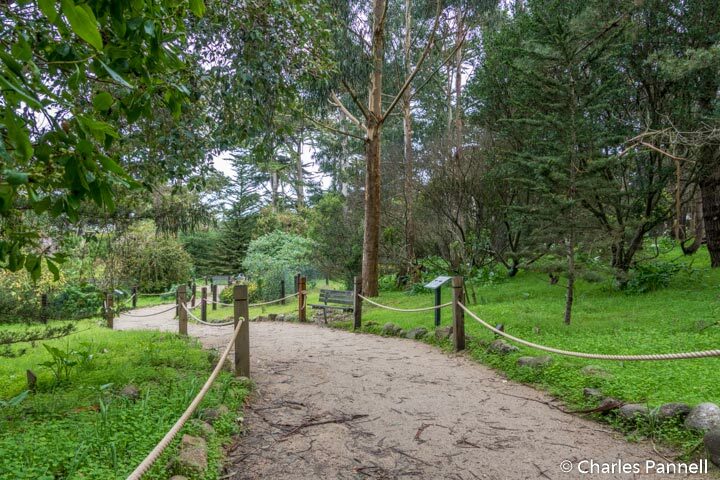 This .15-mile trail winds through a eucalyptus grove, and although it does have a slight downhill grade, there are level spots every 20-30 feet. That said, some manual wheelchair-users may need a bit of assistance on the uphill journey. This is one of the top spots to find the overwintering Monarchs, however it’s usually a hit or miss proposition. Weather plays a big factor in their presence and activity, and you’ll probably strike out after a big storm or on a windy day. That said it is one of their favorite haunts. 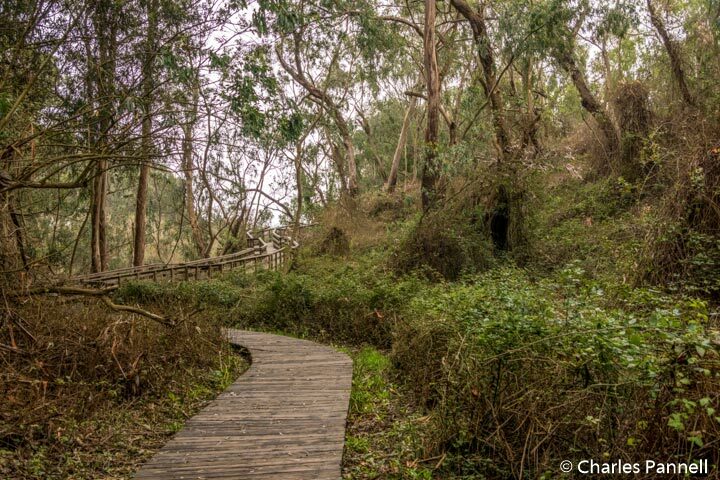 Even if you don’t spot any butterflies, the boardwalk still offers a very nice stroll through the forest. Additionally, it’s a great place for a picnic, as there are two accessible picnic tables on a concrete slab near the parking area. So pack along a sack lunch and just enjoy the afternoon there. Last but not least, don’t forget to stop at Lighthouse Field State Beach, (www.parks.ca.gov/?page_id=550) located just up the street from Natural Bridges State Beach. Just back track on West Cliff Drive, pass the lighthouse, and turn in the parking lot for Lighthouse Field on the left. Alternatively, accessible parking is also available across the street in front of the Santa Cruz Surfing Museum. 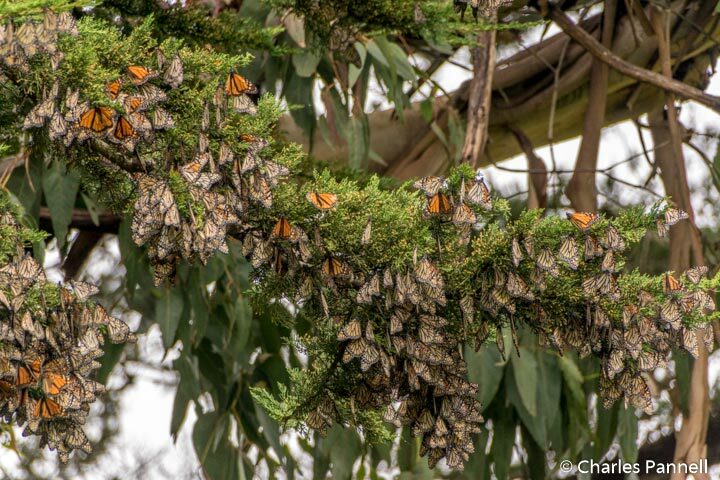 The Monarchs will be in the Monterey cypress and eucalyptus trees in a grassy field near Pelton Ave . Although there’s a sizable population during the winter months, getting there can be difficult in rainy years — like 2017 — as the hard-packed dirt paths to the grove are flooded. It’s about a half-mile walk to the grove, and although West Cliff Drive has a nice paved multiuse path on the west side, there’s no accessible path on Pelton Avenue. Additionally, walking on Pelton Avenue can be quite dangerous, as it’s a narrow road with a fair amount of traffic. Bottom line — this is an excellent spot in dry years, as you’ll not only spot the clumps of butterflies, but there are also individual butterflies flying around near the end of the season. Give it a go and see what the dirt paths look like — and if they’re not a mucky mess, then go for it. After all, it’s on the way from Natural Bridges, and it’s definitely worth a quick stop.